Faceplant Dreams...Sweet Dreams (in 5 languages) Pillowcases. Faceplant Dreams pillowcases are gloriously soft & are made from 300 thread count, quality, 100% cotton. All Faceplant Dreams pillowcases are manufactured in a fair trade environment. Faceplant Dreams pillowcases...the perfect message for the perfect moment. 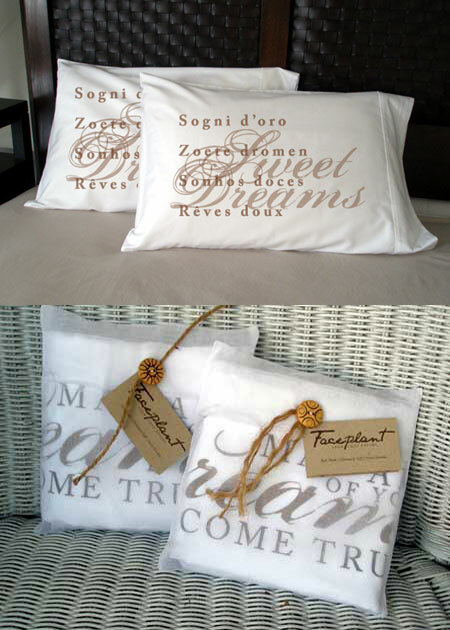 Sweet Dreams (in 5 languages) pillowcases make the perfect gift for every occasion...everyone sleeps! "Say it without saying a word." Faceplant Dreams - Sweet Dreams (in 5 Languages). Each gift set of two pillowcases are elegantly gift wrapped in a fabric envelope,with a unique button to anchor the recycled, descriptive hang tag. Faceplant Dreams pillowcases are made of 300 thred count, quality, 100% gloriously soft cotton.